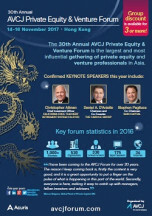 The AVCJ Private Equity & Venture Forum is the largest and most influential gathering of senior Asia focused private equity and venture capital professionals in the world today. 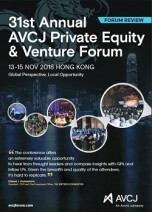 For 30 years, the AVCJ Forum, Hong Kong has brought together leading investors from across the globe for three days of high-level dialogue, debate and networking. This event will combine a programme that will address strategic and tactical concerns, as well as hearing from the world's most successful deal makers. Recognised for creating an invaluable ecosystem for the industry, the AVCJ attracts leading Asian and global funds to host annual meetings, networking dinners and other high-powered events in Hong Kong in parallel.